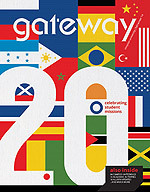 The Gateway is a nonprofit magazine published for friends and alumni of Simpson University, a university of The Christian and Missionary Alliance. It is published two times annually by Simpson University. Transform is a quarterly newsletter designed to inform friends and donors of Simpson University about how their gifts are making a difference. Each issue focuses on a department on campus and includes a student profile, a faculty profile, a trustee profile and a student service spotlight, among other information.